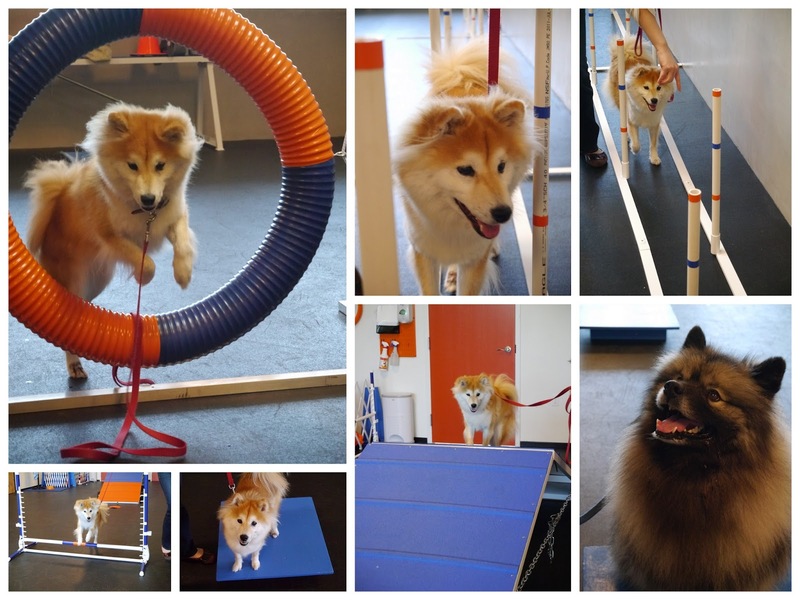 It's been over a year since we took some agility classes. We only went through a series of classes and had to stop due to financial and health reasons (Maya broke her tooth). I thought about going back several times, but hesitated, because, the group of classmates are much advanced and I can no longer join them, and most importantly, neither Maya nor I were having fun. Don't get me wrong, the trainer was great. She competes with her dogs and won so many titles. She focuses on the foundation and makes sure we take every step carefully so the dogs or handlers won't have any bad habits. However, that's just not for us. Maya was relatively young, and all she wanted to do was to greet other dogs or sniff around, so for an entire hour of sit and stay, I had to keep pumping treats into her mouth. For me, I felt frustrated handling the only out-of-control pup, while all the other dogs sit nicely and stay quietly on command. It was a torture for both of us. Fast forward a year, a relative of ours opened up a doggy gym, Zoom Room Belmont, in our neighborhood. I decided to give agility another try and signed up for some classes. This time around, it is much better. In the eyes of many agility enthusiast, we are probably doing it all wrong, because we skipped a lot of the foundations and went straight to using the equipment. However, I don't care and this works for us. For half the price I paid for the "formal" training, we had a full hour of fun and exercise. If someday I really want earn a title with her and have to face the consequences of "bad habits", I'll bang my head then. For now, competition is a plus, but not a must. Another reason I like the place, is because the classes don't come in "series". After purchasing a pass for certain amount of classes, I can go to any classes as long as Maya passed the prerequisite (or evaluation). We then advance to the next level when we are ready. No need to wait for classmates or felt left behind. It works well for someone like me, who may need to travel or have occasional crazy work schedules. There was a related discussion on the forums a while ago about training. I didn't participate since I usually stay away from online arguments, but I agree with some members who said that we should set realistic goals and that life is too short to be frustrated over training a dog. 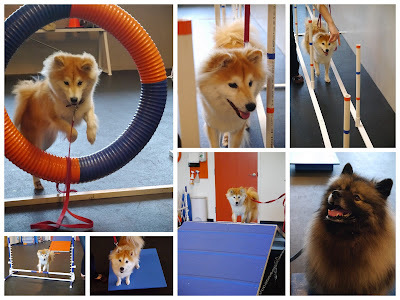 We took Maya to her first class a few days ago, and was pleased to see her having so much fun!